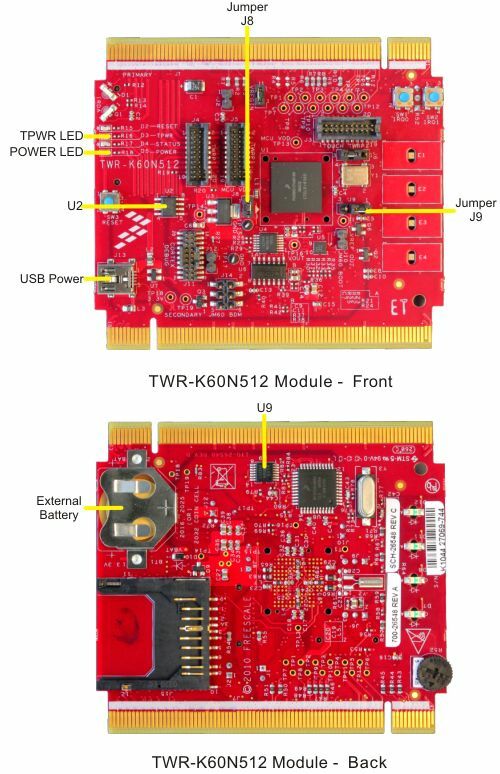 Power is supplied to the MCBTWRK60 board on your PC using a standard USB B connector, or from the Primary Elevator module when installed as a tower system. Jumper J8 may be removed to apply alternate power to the MCU, or for purposes of measuring MCU power consumption. The voltage regulator (U9) generates 3.3 Volts DC. The POWER LED indicates 3.3V power is present on the board. The USB Power switch (U2) enables 5.0 Volts DC. The TPWR LED indicates 5.0V power is supplied from the on-board USB connector (J13). The CR2032 lithium battery supplies 3.0 Volts DC to power the Real-time Clock peripheral. The J9 jumper connects this battery to the VBAT pin.